If you drive down any roadway in any city or town in the nation, the chances are good that if you observe, you will see someone using a smartphone to talk; someone else using a smartphone to text, and someone else watching a video of cat’s that is hugely funny. This is known as distracted driving, believe it or not, though most of the practitioners of this strange and dangerous rite consider it nothing more than something to keep you occupied when you drive. Indeed, if you challenge someone’s supposed “right” to text or talk or look at the latest in kitty vids, you are likely to find yourself up to your earlobes in screaming, invective and no end of questions about your lineage, parentage and many other “ages” as well. It never occurs to someone who is using a smartphone to send their messages or watch their vids or make calls that are endangering lots of people. In fact, they can’t see this piece of the picture at all. Instead, it is business as usual for the texters and posters and others who want would never think of rocking the boat, let alone stop using something that more than one study suggests is harmful. How harmful is it? Drive behind someone you think is texting and watch. If you see the vehicle swerve from the middle of the roadway to the shoulder, hit the shoulder and swing back out again and then repeat the series of moves, then you can be pretty sure the driver is texting or reading texts. Indeed, it is possible that the driver ahead could be watching those funny kitty videos that everyone loves. But, no matter how much everyone loves them cars are not the place for drivers to be viewing them. Now imagine if you have a city where at least half the drivers engage in this type of behavior. Why, it would be a city where people are sometimes hit by drivers who “just didn’t see the person crossing the street because it was dark,” even though it is still pretty sunny and not yet sundown! It would also be a city where cars run red lights because drivers say “there was something wrong with the lights and I don’t know how it happened?” It was a multi-car, chain-reaction accident that caused lots of damage or perhaps injuries. So how would you stop this type of behavior or at least rein it in? Volkswagen has an unusual idea: offer smartphone users unique accessories – cases and the like – that make their smartphones unique. It’s a way the automaker believes it can get people to think twice before they send that text. Volkswagen has teamed up with the Swedish brand management company NordDDB. 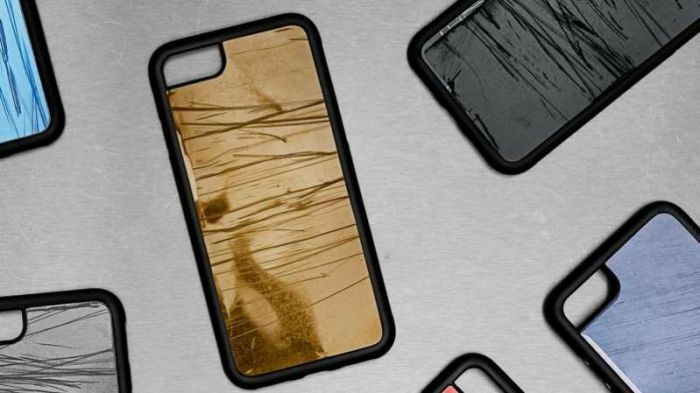 They make smartphone cases from things like the crumpled metal salvaged from car wrecks that are also caused by texting and driving. The project’s purpose is to act like a lighted pointer to remind drivers that Sweden has banned using smartphones in a way that is “detrimental” to driving, though VW, in all honesty, admitted it hasn’t helped to decrease the number of crashes. There are only 153 of these devices planned. The cases are handmade and numbered, one for each crash since the ban went into effect. Called the “Crashed Case,” the individual covers retail for about $69. It is meant to fit the iPhone 8. All the proceeds go to Trafikskadefonden, a Swedish group that helps car crash victims. There are a couple of interesting points arising from this partnership. First, the cases do look cool, and then there’s the story behind the individual cases themselves. And, while it would be nice to think that the ban might be doing some good, but it is not. Just as other studies have concluded, there has been no statistically significant drop in crashes in the wake of cell-phone bans.